The M1911 Pistols Organization is, as the name implies, primarily dedicated to the history, care, maintenance, collection, and use of 1911-type pistols. That doesn’t mean we exist in a vacuum. Although we don’t pretend to understand it, we have heard credible rumors that some members of M1911.org actually own handguns that aren’t 1911s! While such notions are clearly only rumors, the fact that such a heretical concept might even be suggested tells us that we live in a world that is constantly changing, and full of surprises. Although our primary focus is the 1911 pistol in all its variations, our members live in the real world, and through the “pages” of our electronic magazine we try to offer occasional articles to help people be prepared for real world situations. Past articles along these lines have looked at flashlights (tactical and otherwise), backpacks (for the much talked about “bugout bag”), and other gear that’s not 1911 specific. There are times and places where it’s simply not possible (or legal) to carry a firearm, and perhaps not even a knife. In such situations, the only option other than harsh words may be pepper spray. However, there are a lot of companies selling pepper spray and pepper spray units aren’t the sort of thing you try out on your significant other or your middle child. So, in the absence of any first-hand experiential feedback, how can anyone choose what pepper spray to buy? In the following article we’ll try to shine some light on the subject. Pepper spray is not mace. The spray product that was developed in the 1960s and which was known as “mace” was not a pepper spray, it was one of two types of tear gas. Military tear gas is generally a chemical called orthochlorobenzalmalononitrile, or CS. The original mace tear gas was a type known as CN, the chemical component of which was phenacyl chloride. Both compounds are irritants. One factor in the use of CS and CN tear gas is that individuals who are high on drugs may be resistant to the effects of the gas. Moreover, it is possible to train for resistance. I’m a Vietnam veteran. Part of my Army Basic Training included having to go into a big mess tent filled with tear gas. Our training cadre were inside, wearing gas masks. Each trainee had to enter, individually, wearing a gas mask, then remove the mask and recite his name, rank, and service number. We weren’t allowed to leave the tent until we got that right—or until we couldn’t talk at all and they had to pull us out. Those poor souls were allowed time to recover, then they had to go back and try again. Today there is a company called Mace®, and they make pepper spray. So, mace is not Mace®, and not all Mace® is mace. Pepper spray is different from mace. The chemical ingredient in pepper spray is oleoresin capsicum, or OC. Oleoresin capsicum is an inflammatory rather than an irritant. To be more technical, oleoresin capsicum is the oil from peppers. The actual component of the oil that constitutes the inflammatory agent is called capsaicin. And, not all peppers (or not all capsaicins) are created equal. The system developed for rating the “hotness” of pepper sprays is the Scoville Heat Unit (SHU). An ordinary bell pepper from your garden is the baseline, with a rating of 0 (that’s “zero”) SHUs. A run-of-the-mill jalapeño pepper might score 2,500 to 5,000 SHUs on the same scale. 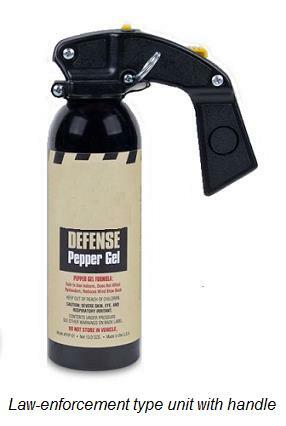 The capsaicin in self-defense pepper sprays is much more concentrated. Pepper sprays sold to the general public range in SHU rating from 500,000 to 1 million or 2 million SHUs. Pepper sprays issued to police may be as high as 5.3 million SHUs. However, it isn’t enough to know how hot the pepper in a spray is. 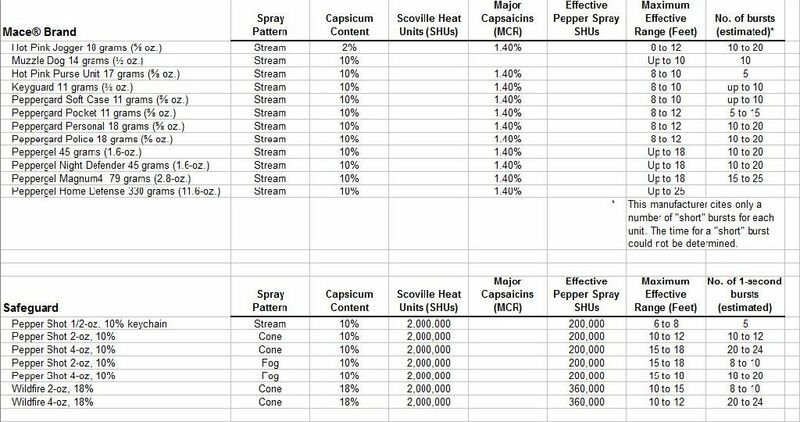 You also have to know how much there is, and not all pepper sprays use as much actual capsaicin or oleoresin capsicum in relation to inert ingredients as others. The OC content in pepper sprays sold to the general public ranges from 2 percent to 10 percent. And then the higher math rears its ugly head. Which is better, a lower percentage of a really hot pepper, or a higher percentage of a milder formulation? If we had all the numbers for each of the criteria discussed above, for each brand and model of pepper spray we wanted to compare, it would be easy. The problem is, no manufacturer provides all that information. 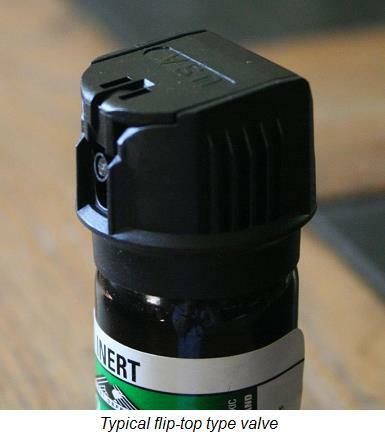 We spent hours looking over the web sites of the major manufacturers of pepper sprays, and we found that it’s almost impossible to find all the information needed to make a meaningful comparison. The brands with a high percentage of OC will advertise that they have the highest percentage of OC—but they may not tell you the SHU rating of their formulation. Other brands, those with “hot” formulations, may promote the SHU rating of their formulation, but they may not be up front regarding the percentage of OC content. If you can find the data to input, what we discovered is that a simple multiplication of the product’s OC content (as a percentage) times the SHU rating of the formulation generates a new number, referred to as “Effective Pepper Spray SHUs.” In comparing pepper sprays based on Effective Pepper Spray SHUs, a higher number is better. Another factor that makes comparing different products difficult is that some manufacturers specify the number of burst (shots) their units provide based on ½-second bursts, while others use 1-second bursts. And some simply claim to provide ‘X’ number of “short” bursts—whatever “short” means. And that CRC rating mentioned above? We didn’t find a single manufacturer who listed that in their specifications. Further along in this article we’ll present a tabulation of whatever comparative specifications we could find after hours of sleuthing on the Internet followed up by several exchanges of e-mails with some of the manufacturers. Even the e-mail contacts were enlightening (NOT!). A (very) few of the manufacturers responded promptly to our e-mail contacts and at least made an effort to answer our questions. Some of those answers were more helpful than others. (I especially liked the response that basically said “See our web site,” when my question was “I can’t find information about ___ on your web site. Can you help me?”) Other manufacturers simply didn’t respond at all. A rhetorical question: Why would any company bother including a CONTACT US link on their web page if they didn’t intend to respond to contacts requesting information about the product? Before we lay out the numbingly boring tables of specifications, there are other aspects of selecting a pepper spray unit that aren’t controversial or confusing, so let’s get those out of the way first. A major consideration is the size of the unit. Like a handgun, the little pepper spray you have with you is better than the big pepper spray you left at home. That said, how much is enough? As the specification tables begin to show, as a general rule larger units offer two advantages: The first, obviously, is more pepper spray. Bigger units allow more and longer bursts. Perhaps more important than the number of bursts, however, is range (or distance). If at all possible, a self defense use of pepper spray should be accomplished before the assailant (or assailants, plural) is (are) close enough to make physical contact with you. A unit that can reach out to 10, 15, or even 20 feet is clearly better in this regard than a unit that only has an effective range of 5 or 6 feet. Those cute little ½-ounce or ⅓-ounce keychain units are handy and easy to carry but, in general, they are very limited in range. Keep in mind that, although a distance of 6 feet is longer than arms’ reach, an assailant may be moving toward you, rapidly. Unless you already have the spray unit in your hand and ready to go, you need time to perceive the threat, assess the threat, decide to get out the pepper spray, and go through the actual motions of doing so. Think about the classic Tueller Drill that’s taught in police academies and self defense handgun classes all over the country. An assailant starting 21 feet away can usually reach an armed person and stab them (with a rubber knife, in the drills) before the person can draw a handgun and fire a shot that would disable the attacker and prevent the stabbing. Where will you carry your pepper spray, and how long will it take you to get it out and use it once you have recognized that there’s an immediate threat to your safety? A handy little keychain unit that’s buried in a purse or in the bottom of your cargo pocket, under a dozen keys, a credit card wallet, a cell phone, a multitool, and a folder of photos of the wife and kids isn’t going to be as easily deployed as a larger 1-ounce or 2-ounce unit carried in a holster attached to your belt. For riot duty, police officers use pepper spray units that rival small fire extinguishers in size and are equipped with handles, not unlike professional paint spray guns. Such riot control units aren’t practical for personal carry, but the fact that they exist is testimony to the need for larger units and longer range for the most demanding situations. It goes without saying that you want to spray the bad guy, not yourself … so we’ll say it anyway, for emphasis. In order to prevent accidental discharges, all pepper spray units have a safety interlock that’s intended to prevent accidental discharges. In general, these fall into two types: twist-lock, and flip-top. If possible, try to look at both types in stores and determine which feels more comfortable for you to use..
As a very general rule, the flip-top style safety seems to be more suitable for all sizes of hands and fingers, while the twist-lock style may be more suitable for people with small or thin fingers. One of the popular keychain style, ½-ounce units that comes in a leatherette case with a snap flap over the valve seems to come only as a twist-lock style safety. With these units, it’s important to ensure that the discharge nozzle remains pointed out through the opening at one side of the flap while the twist-lock mechanism remains accessible on the opposite side. If it should be necessary to use the pepper spray, the time needed to adjust the position of the spray unit within the case, or to unsnap the flap, could make all the difference. Opinions seem to vary regarding the “correct” way to hold and to activate a pepper spray unit. 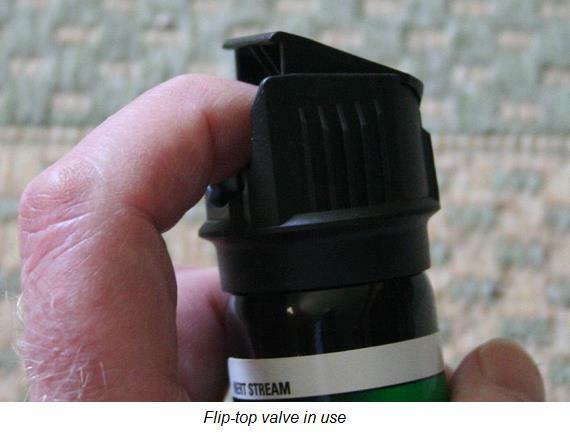 Several sources I encountered recommend holding the spray unit in your fist and using the thumb to operate the valve mechanism. There are advantages and disadvantages to using this method. The primary advantages are that (1) the full fist grip provides a very strong hold on the canister, and (2) holding the fist straight out with the thumb at the top is a natural position for the hand. To me, however, this hold feels very unnatural. The goal when using a pepper spray is to deliver pepper onto the attacker’s face, and the muscles of my hands simply are not accustomed to pointing with the thumb. 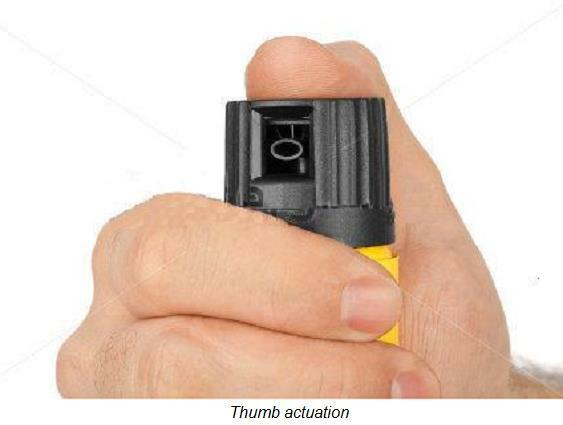 Before I read the recommendations to use the thumb for activating a pepper spray unit, any time I picked one up my instinctive impulse was (and still is) to put my index finger on the valve. There are different types of spray pattern for pepper spray units, and each spray pattern is suited for different conditions. The three basic types are stream, cone, and fog. A fourth variation is the gel stream—more about that later. 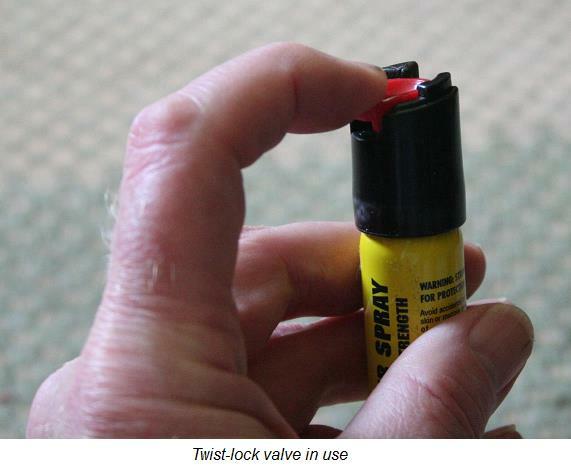 Pepper spray is effective when the pepper formulation is sprayed onto an assailant’s face and in his eyes. The goal, obviously, is to put the spray there, as effectively as possible, without also spraying yourself or innocent bystanders. A thin stream provides excellent directional control and maximum range for the size of the unit being used but a narrow stream requires more precise aim, especially at longer distances. A compromise that allows somewhat wider dispersion while still providing adequate range is the cone pattern. A fog pattern provides the widest dispersion but has the shortest range. In addition, because the spray is released as a fog of tiny droplets, when used outdoors the fog pattern is most prone to being blown off-target by wind or, worse, blown back into the user's face. The fog pattern is best suited for situations involving close range (which should be avoided if possible) or multiple attackers. In order to address the problem of wind carrying the pepper off target when used outdoors, many manufacturers now offer gel stream formulations. This packages the pepper in a gel formulation that has more mass and more cohesion than the thin liquid of the other spray types. This results in a stream that is much more resistant to being blown away from the intended target by wind. Some manufacturers offer inert training units to allow familiarizing yourself with how to use your pepper spray unit without incapacitating yourself or anyone near you. 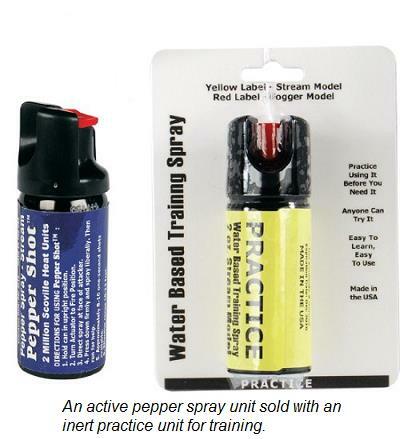 A quick search on the Internet may take you to sources offering package deals that include either one pepper spray unit with one inert training unit, or two pepper spray units with two inert training units. These are a good deal for a first-time buyer, even if the pepper spray isn’t necessarily the absolute best unit on the market. There’s no substitute for seeing exactly how your unit will function when you use it, and the best way to simulate that is the inert training units. I commented above that each manufacturer’s advertising focuses on that company’s best features and avoids discussing areas in which their product doesn’t compare favorably with the competition. That’s understandable; if I were in a business, I wouldn’t make a point of discussing where my product isn’t as good as my competitors’ products. But, in the case of pepper sprays, the manufacturers not only focus on their own strong points, they seem to go out of their way to avoid providing sufficient information to allow anyone to make a complete, informed comparison of competing products. 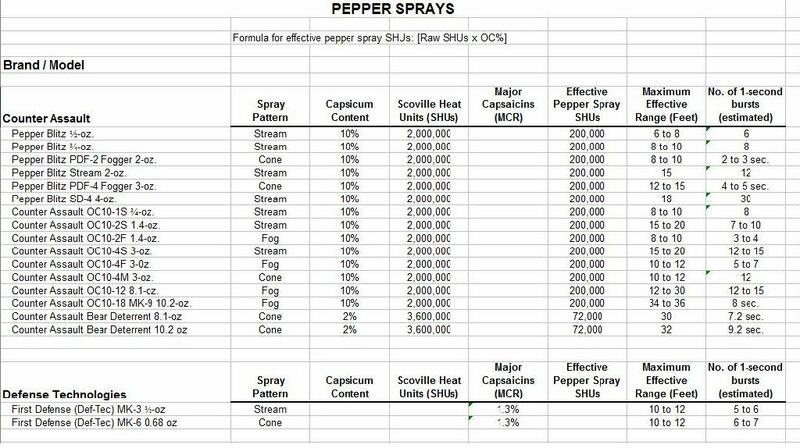 The table below sets out the comparative information we were able to compile on a number of brands of pepper spray units available to the general public. Where there isn’t any information listed, it’s because we couldn’t find it. For many of these products, we contacted the manufacturers directly to seek out missing information. Some responded to our inquiries, others did not. Some of the responses were helpful and provided the missing information (or some of it), while others either declined to provide further information, or referred us to their web site—which we had already consulted before contacting them. The information we provide below is the best we could do. 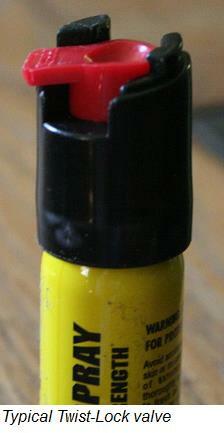 Some manufacturers also offer pepper spray products intended for uses other than protection against human predators. Among these are primarily bear sprays and units intended for protection against dogs. We felt that discussion of these products was beyond the scope of this article. For readers who are concerned primarily with protection against dogs when walking, be aware that such products are available (although not all retail outlets may carry sprays formulated for dogs). For people who plan to hike in areas known to be inhabited by bears, we strongly advocate carrying a spray unit formulated and sized specifically as a bear deterrent. This is even more important if hiking in bear country where the jurisdiction doesn’t allow the carrying of a firearm for protection. 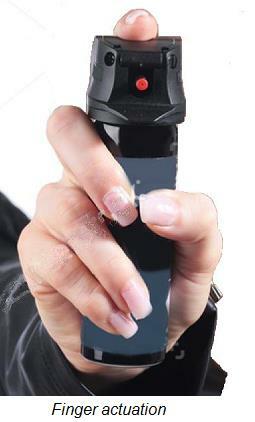 A few companies also offer pepper spray units shaped like handguns, to facilitate use and aim. These gun-shaped units are not all the same. If you might be interested in such a unit, do some research into what type is best. Kimber (the 1911 handgun maker) offers a gun-shaped pepper unit that does NOT emit a spray but fires gel pellets containing the pepper formulation, akin to high-potency paint balls. On the other hand, at least one other manufacturer offers a gun-shaped pepper spray that functions like a conventional pepper spray unit, packaged in a gun-shaped device. In general (which is a dangerous statement to make, so keep reading), pepper sprays are legal to own in most places in the United States. However—some jurisdictions impose restrictions and regulations on the sale, use, and/or carry of pepper sprays, so (as always) be sure to study the laws in your location to avoid legal problems. For example, in New York there are limitations imposed on the size and formulation of pepper spray unit that can be sold to the general public. In some states, although carrying a pepper spray unit is legal, the purchase of pepper spray units over the Internet is not allowed. In these states, the pepper spray must be purchased from a bricks-and-mortar retailer (often a licensed FFL gun shop) within the state. As always, there is no substitute for knowing the laws of your jurisdiction. The general rule in the industry is a shelf life of four years. However, you don’t know how long that unit has been on the merchant’s shelf, so that doesn’t automatically mean four years from your date of purchase. And al teast one manufacturer lists their product as having only a three-year shelf life. Always look for an expiration date on the unit itself. If there isn’t a date, make a note of your date of purchase and plan on replacing the unit in a year, or perhaps two years at the most. As I researched this subject, it seemed that the more I learned ... the less I knew. That's probably normal when you start to know how much you don't know, but it doesn't halp make a decision. In an attempt to get some real-world perspective on the issue, I reached out to a friend who is a retired police chief and law-enforcement academy use of force instructor. I asked what to look for in choosing a self-defense pepper spray. His advice was to buy a brand name if possible, and to look for at least 1,000,000 (that's one million) Scoville Heat Units and at least a 10 percent formulation. Fortunately, there seem to be a lot of units on the market that satisfy these criteria. I also had an unintentional, personal introduction to the efficacy of pepper sprays. I had a 2-ounce unit of unknown manufacture, but well beyond the expiration date. I decided to test it to see what the spray pattern was like, so I stepped out on the front porch, aimed it at the front lawn, and pressed the valve button. Nothing happened. At least I had first-hand, proof positive of why it's important to carry a fresh unit. But ... maybe a half hour later I made the mistake of rubbing my eyes with the same hand that I had used to test the expired pepper spray unit. That was a BIG mistake! I knew almost instantly that I had committed a serious tactical error. There was so little pepper formulation on my fingers that I didn't even know it was there, and my eyes teared up immediately and burned and watered for probably half an hour. Based on that experience, I don't ever want to be sprayed with a full-charge pepper spray unit. And I think it's safe to conclude that any unit you get from a reputable source is going to be a lot more effective at deterring an assailant than harsh words. Be safe, and always "watch your six."